- This quest begins immediately after Spoils of War. Speak to Proctor Ingram, then place the Berylium Agitator you found in Spoils of War into the back of Liberty Prime at Boston Airport. Press the big red button on Proctor Ingram’s console to set Liberty Prime into motion. 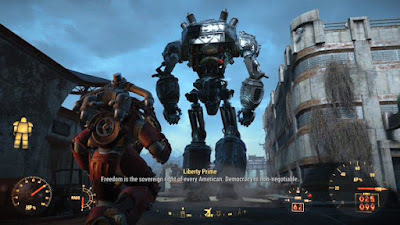 - The big galoot doesn’t waste any time, and Liberty Prime will immediately set off for the C.I.T. Building. The robot will come under attack by Institute forces multiple times during his cross-city trip, but Prime is more than capable of taking the Synths out on its own - and by the time Prime reaches C.I.T. grounds it will have a more-than-sufficient contingent of BoS soldiers on hand for protection. Still, Prime has some priceless lines if you choose to follow it by land, and the Synths are a gold mine of Fusion Cells. - Prime will carve a massive hole in the ground after a fair amount of fighting. Dropping into this hole will complete the quest and trigger a new one, The Nuclear Option.